Quilting on yet another block completed today! 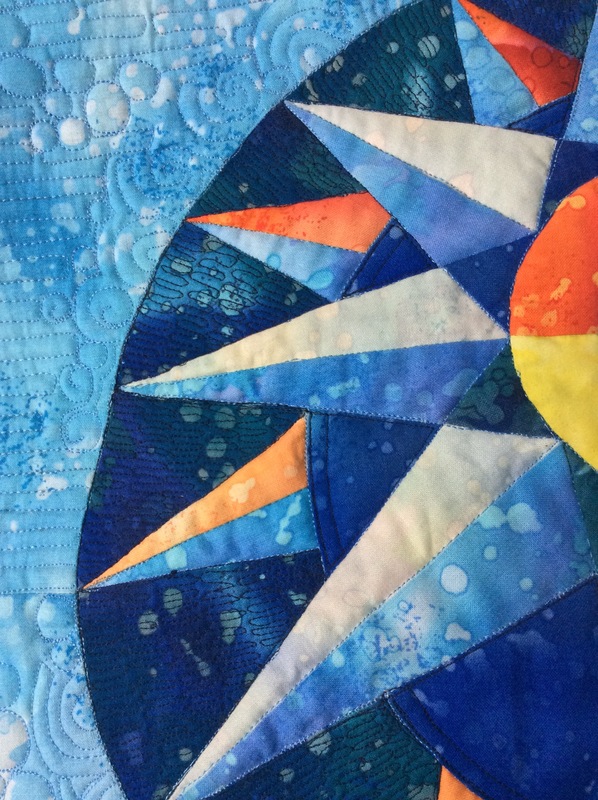 Here are some close ups of the quilting on Southward Bound, which was the seventh block of the Dreamcatcher Round the Year Quilt. ‘Stitched in the ditch’ with a bit of echo quilting. I used the walking foot to ‘stitch in the ditch’ all the needles and the inner circles. i decided against doing any more quilting on the inner circles. Any suggestions? 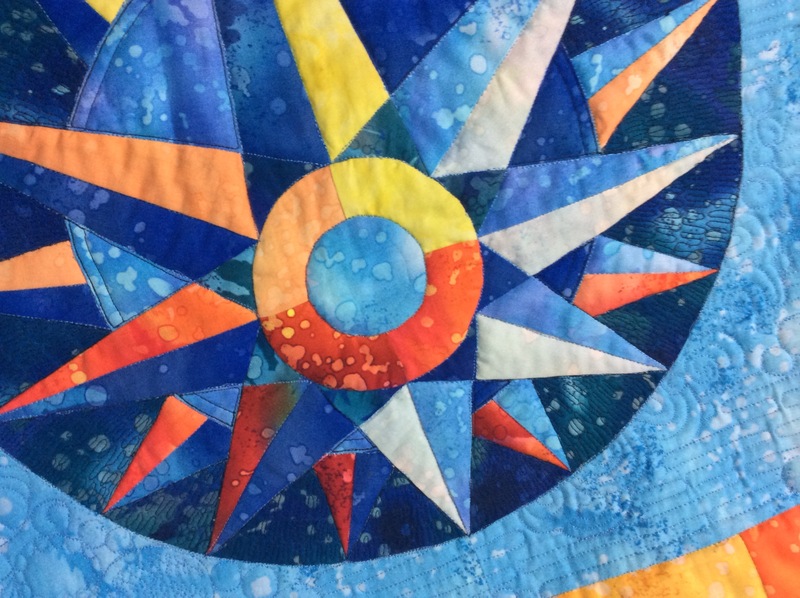 I debated if I needed to quilt the middle ( blue) offset circle, but decided against that. Getting the hang of doing free motion quilting with the machine on auto-mode. 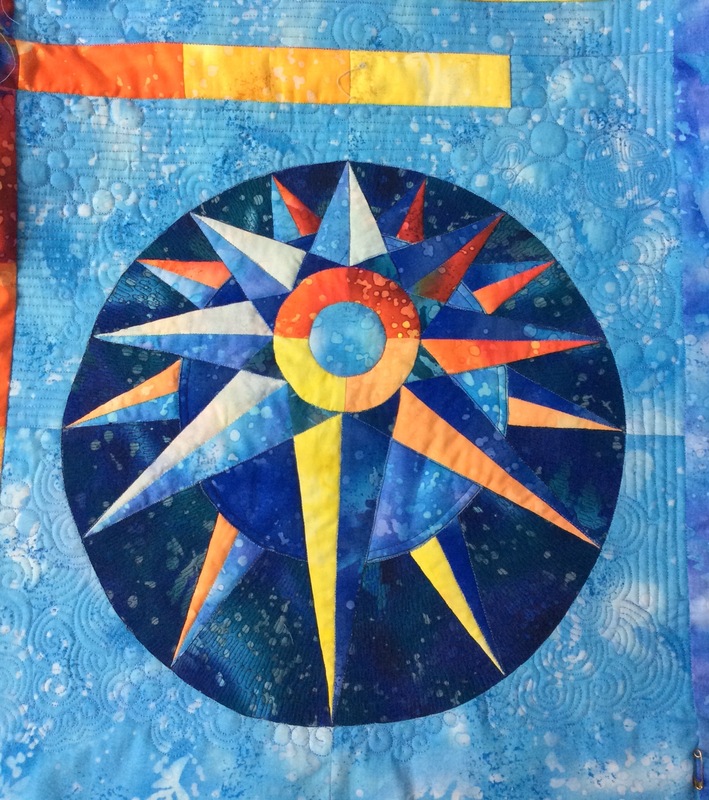 I am getting the hang of free motion quilting now! I am absolutely certain that you cannot get good results ( as a beginner, at least) if you do not use good quality thread and needles. For this block, I used a Schmetz needle and Sulky threads and the difference it made was amazing! A picture of the back will give a better idea o the quilting on the wedges! The quilting shows up much better on the back, doesn’t it? This was a block which was more difficult to draft than to put together! Would you like to make your own 18″ block? 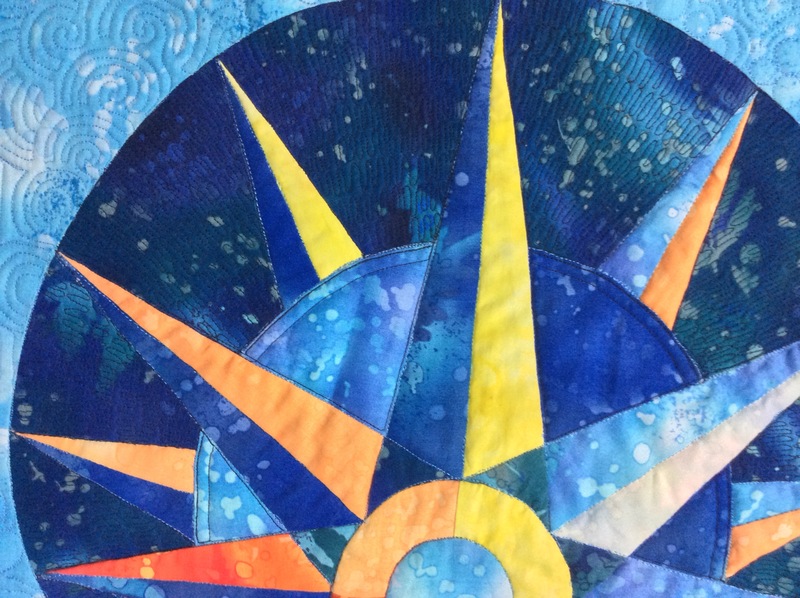 You could make a mini quilt with a single block or even frame it! The free pattern is available here. You could do a really modern version to , like I have done, in ‘Rainbow’ colours. As soon as I finish this quilt, I will start putting together the Rainbow Dreamcatcher too! The centre circle is also a smaller compass! However, the pattern is not given for this centre. Here is the full block! I move next to the Winding Ways Block. Mulling over how I shall tackle that! 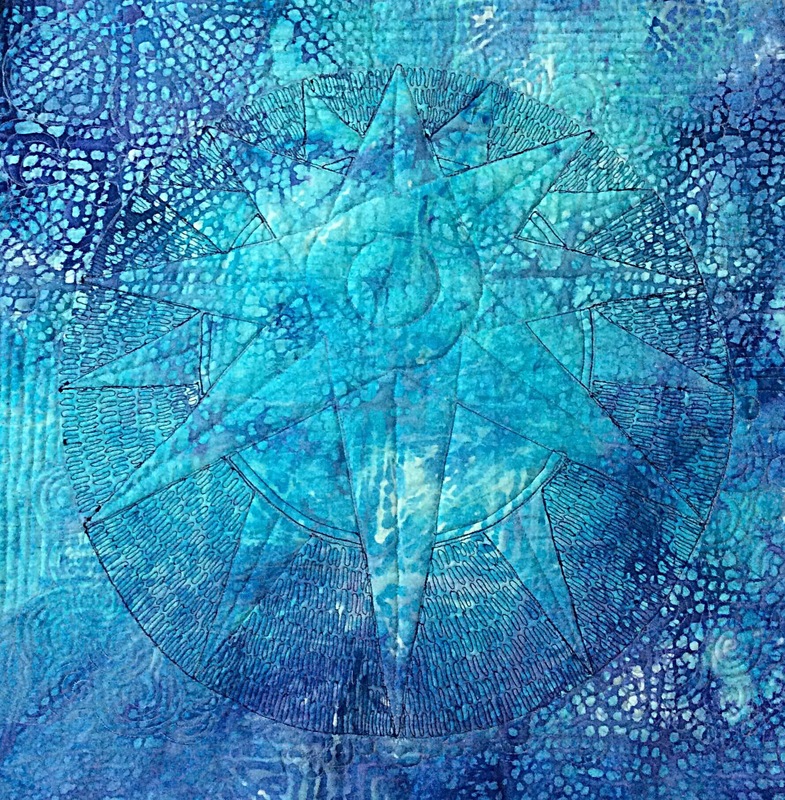 I finished quilting the Chakra Block, Block Ten of the Dreamcatcher Round the Year quilt today! 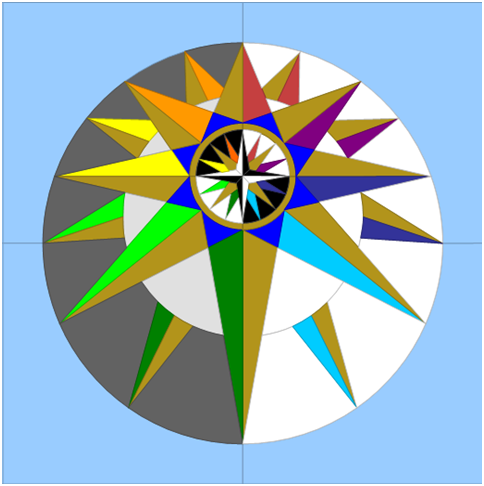 You can follow this link to find the free pattern for this block inspired by the ‘Ashok Chakra’, or the Dharma Chakra ( Wheel of Righteousness), which finds the pride of place at the centre of the Indian national flag and is taken from the edicts of the great emperor Ashok, who ruled over almost the entire sub-continent, in the third century B.C. Just three more blocks to do, then I move to the outer dark blue fabric panels! 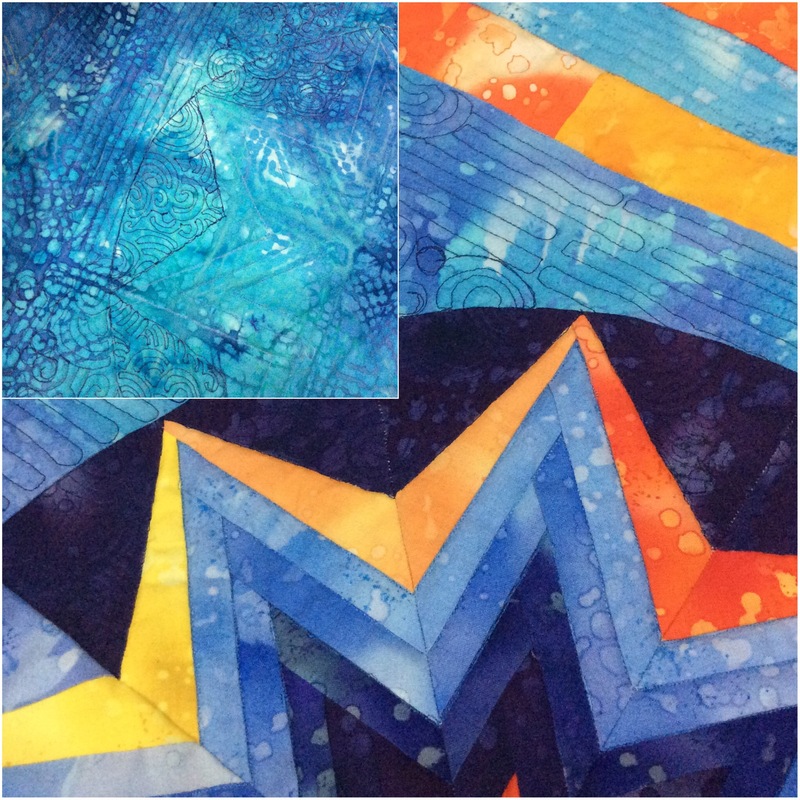 Do share your quilt blocks on my facebook page ‘Patchwork of My Life’. Have a great weekend! 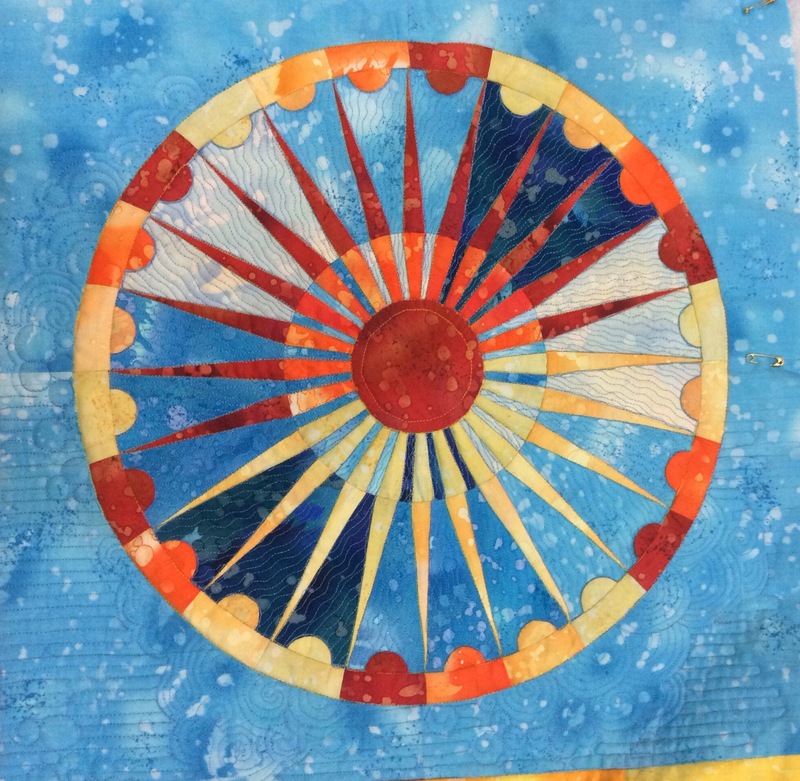 Author MadsPosted on May 28, 2016 Categories Patchwork of my life, Round the Year quiltTags Ashok Chakra, Chakra quilt Block, dreamcatcher Round the Year quilt, free motion quilting, Wheel quilt block2 Comments on Spinning The Wheel! मंज़िल भी मैं, फिर क्यूँ फिरूँ उदास-हताश मैं? दर-दर क्यों गया था? सिर्फ़ पानी की की प्यास में? कोई न अब कहे कि हूँ निराश मैं! If we need that vacuum cleaner..
Made 35 fabric pouches/ envelopes as gifts! Took me much longer than anticipated. I was aiming for a ten-minute finish; I averaged 20! For one, I used left over fabric lengths to cut out the squares individually. Secondly, I had to overlock the edges of the brocade and silks with a zigzag to prevent fraying. Thirdly, I think I have got so used to piecing and quilting that I have forgotten how to sew straight! I quilted only 6 of them, the ikat and the floral print are a single layer. The rest are double layered. Not all have strings. 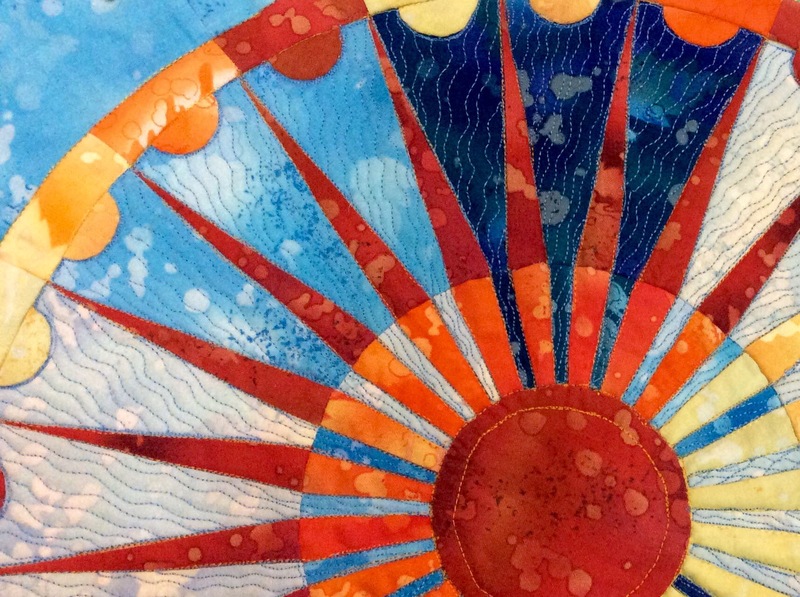 From tomorrow, back to quilting!